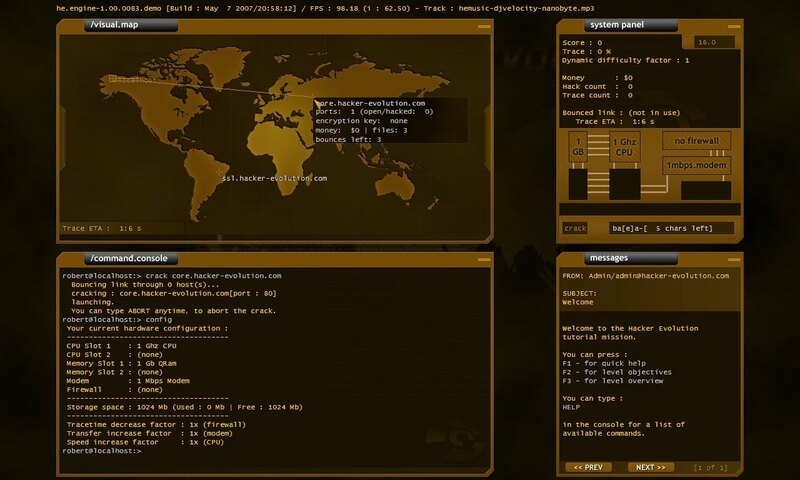 Take down the hacker threat in this simulation-puzzle game. Is there a better alternative to Hacker Evolution? Is Hacker Evolution really the best app in Simulation category? Will Hacker Evolution work good on macOS 10.13.4? Version 3.10: Release notes were unavailable when this listing was updated. Hacker Evolution needs a review. Be the first to review this app and get the discussion started! Hacker Evolution needs a rating. Be the first to rate this app and get the discussion started! Hacker Evolution is a totally unique experience, challenging the evolved gamer's intelligence, attention and focus to create a captivating mind game. Stock exchanges. Central banks. Satellite uplinks. Transoceanic fiber optics links. All mysteriously succumbing to an unexpected "evolution" of the web. When the world’s critical services start to collapse, you know this is more then a simple event. Who or what is behind it? Only an experienced and dedicated hacker, with know-how gained as an international cyber-intelligence agent, can root out the cause and bring it down. The creators of Digital Hazard and BS Hacker bring you to new levels of hacking simulation, with unparalleled graphics and a pulse-pounding sound track. Hack into computers, look for exploits and information, and steal money to buy hardware upgrades as you attempt to assemble the pieces of an international puzzle. Your virtual operating system environment is packed with the features to immerse you in the role of world-class hacker. Hacker Evolution is a totally unique experience, challenging the evolved gamer's intelligence, attention and focus to create a captivating mind game. Solve puzzles, examine code and bits of information, and evade the system’s trace to reach your objectives.